Bangkok - Hua Chang Heritage Hotel, Maeklong Railway Market, Hello Kitty Cafe | JACQSOWHAT: Food. Travel. Lifestyle. It was a last minute decision to go BKK before my school starts, mainly to cafe hop and massage! 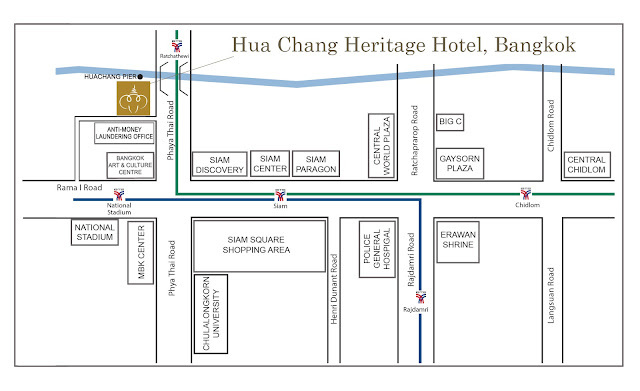 And back to my favorite hotel in Bangkok - Hua Chang Heritage Hotel. A luxury 5-star boutique hotel located a stone throw away from National Stadium BTS, MBK and Siam night market. I always stay back here whenever I'm back in BKK, for it being luxury, spacious and clean! No doubt it's slightly pricey as compared to the average hotel cost in Bangkok. It's about $130 per night including breakfast but I wouldn't mind paying slightly more for a comfortable stay. Free WiFi yes! Everything in the room is controlled by a iPad device, no remote no switches. Did some night market near siam area the night before, and greeted with hotel breakfast buffet the next morning! The only reason I wouldn't mind waking up early for. A range of American stay breakfast, as well as Thai savoury food such as green curry. Not much time during our trip, if not we would probably dip in the pool! The first thing on our itinerary for Day 2 is Maeklong Railway Market, the world's most dangerous yet interesting Thai market. We wanted to explore something different this time so here we are. We take a train to BTS Victory Monument and take a mini van from there at 70 baht per person. The market is open from 7am to about 3pm where the last scheduled train goes. Be there early! We arrived at about 2pm after an hour van ride from Victory Monument. At the station you will find the timetable where the train will pass through the market. The timing is subject to change but as you can see there are 6 trains per day that travel between Ban Laem and Maeklong. The next scheduled train is about 230pm so we just hang around that area for that 30mins. The market is basically selling fruits, vegetables, chilli paste and some of Thai spices. The crowds were all probably waiting for the same thing, which is the train passing by. When its 5 mins before the scheduled time, a loud siren went off followed by a horn and the crowd starts moving around for video/photo. The vendors were so calm while packing not even a slight look of panicking. (I guess they do it everyday so this is just normal) Five minutes later, they efficiently packed all things including bringing in the tent. Please stay calm and follow the instructions from the vendors like standing behind the line. As you can see, the train can get really close to you. After it reaches Maeklong Market, it will go back the same route to Ba Laem. After that, it is back to normal business again. The market changes within minutes like a magical scene, it's so quick you wouldn't even know something bad just passed through the crowded market. Nevertheless, it was a great experience to witness this! You can either head to Amphawa Floating Market after this which is nearby or the same route back to Bangkok. For us we decided to head back to Bangkok via the mini van again. It was a short distance away from the market and we managed to get here after a vendor guided us. Randomly head into a Japanese restaurant in Siam Square for dinner as it was mad crowded. Don't remember the exact name for this restaurant but it's the only one which offers Japanese charcoal BBQ. Decided to check out the newly opened Hello Kitty cafe which is also located at Siam Square. Not surprise to find that there's a waiting list to get in. All Hello Kitty's fanatic, this is your heaven. All things pink and hello kitty including the ceiling and furnitures. This is the 3rd Hello Kitty store I visited in Asia, others being in Seoul and Taipei. We ended off the night with Korean Bingsu from Seobinggo which is directly opposite Siam Square. Great place to chill over a bowl of bingsu, reminds me of the good old days in Seoul. It may seems like a short day for us but I guess we wasted most time in travelling especially when Maeklong is located outskirt of Bangkok. Not forgetting the terrible Bangkok jam. That's a wrap for Day 1 - next will be documenting down more food experience and night markets like Talaad Rot Fai Market. Stay tune!